Not to long ago I blogged about Neutrogena's Ultra Sheer Liquid sunblock that makes a great facial sunblock, but as it's winter my skin needs more moisturizing as well as SPF protection. 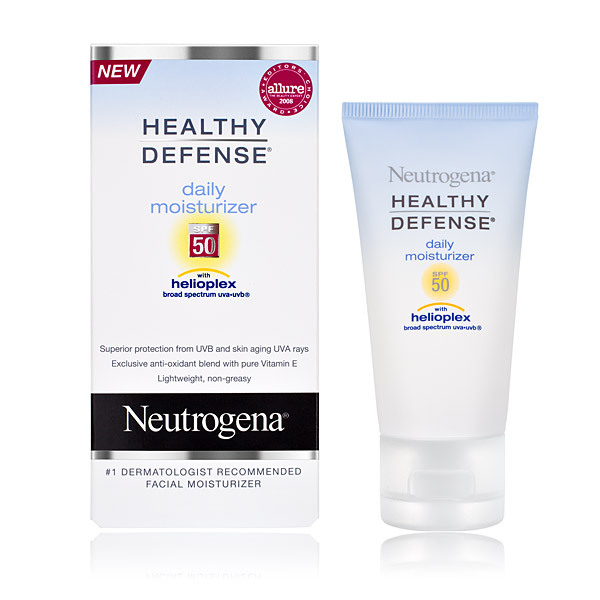 That's when I turn to another Neutrogena product, Healthy Defense Daily Moisturizer SPF 50. Although I always apply a moisturizer after washing my face, I find in the winter a creamy sunblock for my face doesn't go amiss. This stuff is great. It's thick and creamy, but blends into my skin well leaving it feeling moist and not greasy. I do have fairly dry skin, so I find this a great alternative to the Ultra Sheer Liquid on days when I need a bit more moisture. It also doesn't feel heavy and works well under makeup. I really can't recommend this stuff enough. My only regret is that it's not easily available in the UK, but it is in the US and retails for $13.99. I love moisturizer that goes well under makeup. I'm also dryskin so I feel your pain!